The Study’s Already Been Done! Does the construction of new interstate highways create economic development? The Federal Highway Administration funded a study, that was concluded in February of 2005, on economic effects of selected rural interstates at the county level. These studies examined nine interstates or near-interstate corridors. The research correlated data – generally county level – on population, employment, income, etc. with the time period before, during, and after completion of the interstate. The research confirms previous FHWA statements that highway improvement, by itself, does not bring economic development but, in some cases, combined with other effects, the highway improvement can lead to such development. In some counties, changes in population, employment, income etc. were similar to changes in counties without interstates. In a number of counties economic growth was anemic despite proximity to an interstate highway. For example, anemia was the case in Emanuel, Treutlen, Wilkinson and Twiggs counties in Georgia that are in the I-16 corridor (I-16 does not go through Wilkinson county, but does go near it.) For these counties, the advantages of the interstate (employer access to labor, labor mobility, supplier access to market, etc.) simply were less significant than other economic conditions – for example the relative decline of the US industrial economy. In fact, there is some speculation that in portions of these counties, the I-16 suppressed economic activity: either by facilitating retail activity outside the area that would otherwise remain in the county; by diverting through traffic from non-interstate highways; or, by acting as a physical barrier to commerce. Three places with economic gains were identified along the I-16 corridor. Two of those were near the metropolitan area of Savannah. The other Dublin, Georgia, is located halfway between Savannah and Macon. Dublin proved to be an exception to the downsides and showed increases in warehousing and distribution because the luck of its location. I-16 was not the only corridor with some counties lagging behind in economic growth. Similar examples occur in the other corridor studies. An interesting example of such a county in the South Carolina I-26 corridor is Orangeburg County, which is between I-26 and I-95. In this county, one of the problems preventing economic development is access to utilities. The case studies showed that new highways did sometimes facilitate major new industrial and warehousing activity, particularly where there were existing labor markets, connections with other highway routes and available land with zoning and sewer/water infrastructure to encourage such development. 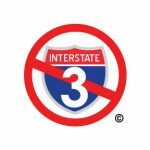 Most of the areas where Interstate 3 is proposed to go through do not have these supporting infrastructures. If this Federal Highway Administration study says that proposing an interstate highway through rural farmlands and national forests will not bring economic growth, why do Senatorial and Congressional representatives from Georgia say that it will? Does the United States just have way too much money and need to throw some of it away on a “feasibility study” that duplicates a study they did five months ago? The study’s already been done. Interstate 3 just doesn’t make sense.